Select items from the Kenilworth CC library will be auctioned tonight, including a collection of Chess Informants. The club intends to sell the 60 or so Informants as 1 lot and the 4 Encyclopaedia of Chess Endings volumes will comprise another. All others items will be single-pieces. 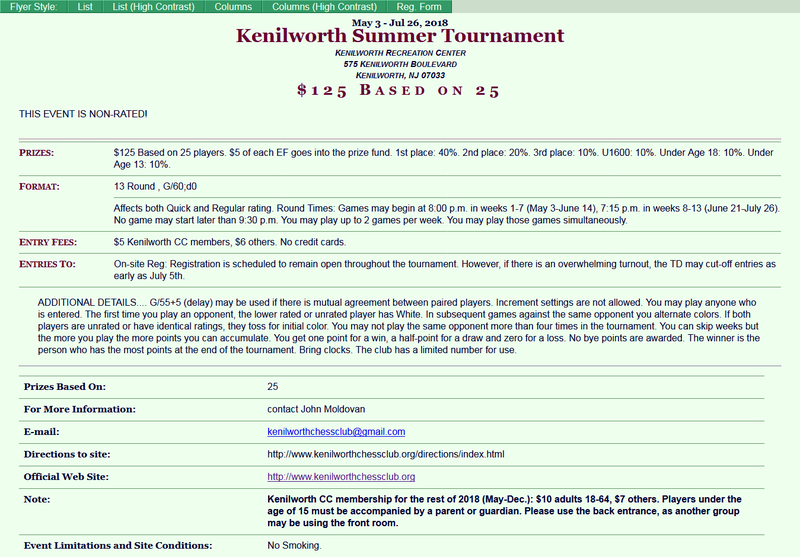 The Kenilworth Summer Tournament will be starting on May 3rd, a month earlier than in previous years. 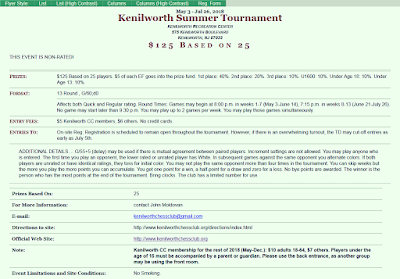 The tournament will run from May 3 through July 26. Entry Fee is $5 for club members, $6 for non-members. $5 of each EF goes into the prize fund. 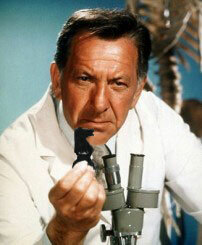 The time control is G/60. G/55+5 (delay) may be used if there is mutual agreement between paired players. Increment settings are not allowed. You may play anyone who is entered. The first time you play an opponent, the lower rated or unrated player has White. In subsequent games against the same opponent you alternate colors. If both players are unrated or have identical ratings, they toss for initial color. You may not play the same opponent more than four times in the tournament. Games may begin at 8:00 p.m. in weeks 1-7 (May 3-June 14), 7:15 p.m. in weeks 8-13 (June 21-July 26). No game may start later than 9:30 p.m.
You may play up to 2 games per week. You may play those games simultaneously. You can skip weeks but the more you play the more points you can accumulate. You get one point for a win, a half-point for a draw and zero for a loss. No bye points are awarded. The winner is the person who has the most points at the end of the tournament. Prizes: 1st place: 40%. 2nd place: 20%. 3rd place: 10%. U1600: 10%, Under Age 18: 10%, Under Age 13: 10%. Registration will remain open for the duration of the tournament. However, if there is an overwhelming turnout, the TD may cut-off entries as early as July 5th. Bring clocks. The club has a limited number for use. John Moldovan won last year, in 2016 and in 2008. Other past winners of this popular event include LM Scott Massey (2004), LM Mark Kernighan (2005, 2011), Greg Tomkovich (2006), Ari Minkov (2007, 2010), Ian Mangion (2009) and Bob Sherry (2012, 2013, 2014, 2015). Rating of the Kenilworth Spring Swiss has been delayed. We are waiting for the USCF to approve a membership exemption for life member Bob Hunt, who is listed as inactive. Hopefully this matter will be resolved today. LM Mark Kernighan defeated NM Maurico Camejo in just 11 moves last night to win the Kenilworth Spring Swiss. Camejo, Gilberto Benitez & I tied for 2nd. Notes to my draw & Kernighan's miniature will follow. Look for them tomorrow Saturday night.